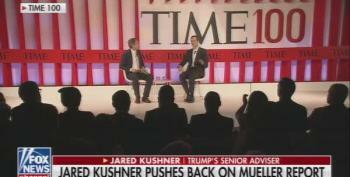 Law professor emeritus Alan Dershowitz suggested on Sunday that Donald Trump has a "due process" right to a "rebuttal report" at the same time that special counsel Robert Mueller releases his findings in the Russia investigation, though there is nothing in the special counsel regulations that require that. "Remember, we're going to see a rebuttal report from the Trump team," Dershowitz told ABC's This Week. "The American people should withhold their judgment until they see both reports." Political analyst Dan Abrams interrupted to disagree with Dershowitz. "This will be the first time in American history where a defendant or someone that's accused of something gets to write a response report to what an indictment is," Abrams remarked. "Every criminal defendant in America would love to be able to write their own report about what they say happened. But that's not the way the system works." "You're contradicting yourself!" Dershowitz exclaimed. "This is not just a yes or no. You're saying that special counsel has special obligations to release everything. And if they have a special obligation to release everything then there is an obligation to allow a response." "That's fine," Abrams shot back. "Fairness requires a response," Dershowitz continued, demanding "a simultaneous release of both" reports. "That's ridiculous," Abrams countered. "The idea that you have to allow the other side, in something like this, the opportunity to file a long report in response to a prosecutor." "You don't have to do that if you just limit yourself to indictment or not indictment," Dershowitz opined. "But if you go beyond it, you start telling a story, the other side of the narrative has to be produced as well. That's required by fairness and due process." "[It's] not in the regulations," ABC host George Stephanopoulos observed as he concluded the segment.